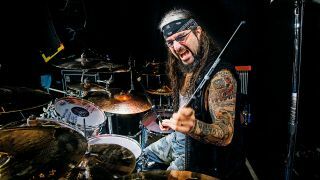 Mike Portnoy has revealed that he’ll bring the worlds of rock, metal, prog and fusion together at a new music camp in 2019. It’s titled Mike Portnoy’s Percussive Nation and it’ll take place at the The McCormick Hotel in Scottsdale, Arizona, on July 8 - 12 next year – and he’ll be joined by a range of musicians including Alex Skolnick, Tony MacAlpine, Gregg Bissonette, Simon Phillips, Blake Richardson, Billy Sheehan, Chris Broderick and Dave Larue. The music camp will cater for all ages and abilities, with Portnoy explaining: “Percussive Nation will be the first music camp I’m heading on my own. “The educational aspect has been a big part of my development as a drummer. I’ve done hundreds of clinics, pretty much on every continent. I’ve also done three instructional videos. But around 15 years ago, I stopped doing formal clinics. Portnoy adds: “We’ve got guitarists, drummers, and bass players, all from different universes – metal, fusion, rock. I’d encourage all the different kinds of musicians attending to go to every class – the drummers should check out the guitar and bass workshops and so forth, it’s so important." Along with musicians, instructors will also be on hand to lead people through a range of musical styles. Portnoy adds: “I play in six different bands at the moment – so the lineup really represents all the different aspects of what I do, from metal to prog to classic rock and pop.